Time to slow down, soak in the sun, relax with a few good books, refresh, re-inspire, have fun and let your imagination run free. As luck would have it, a carnival was headed my way. Perfect timing as I was looking to redesign this blog with something light and colorful that would shout... summer! 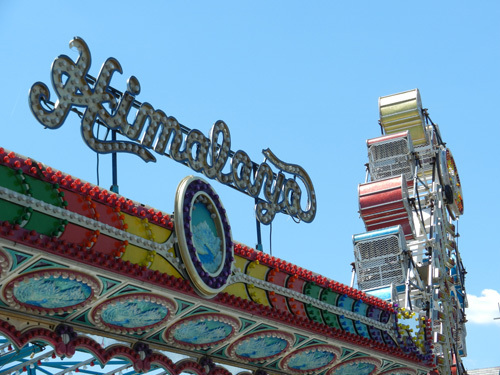 Images of amusement rides and fairgrounds seemed a perfect choice. 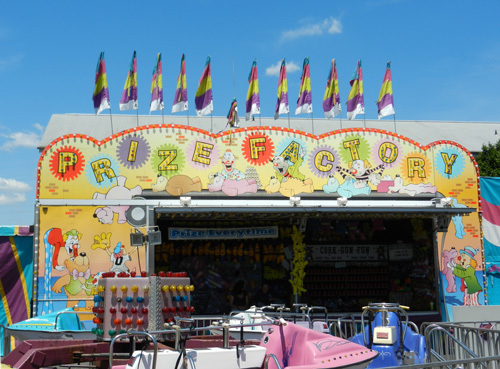 When I called Our Lady of Good Counsel Parish to see about taking photographs of their carnival before it opened to the public, the response was, "Oh, are you from the wedding party?" Wedding party???... How cool is that! To which I simply answered..."No". Thankfully, I was given a 'yes' to take pictures before the official opening and when we arrived at the location, we were thrilled to find the grounds open and empty with the exception of a few 'carnies' making preparations for later that evening. In what seemed like seconds, closer to an hour, 43 shots were taken. Michael and I had great fun moseying about and looking at brightly colored mechanical things and signs from all different angles. We would have stayed longer but the heat was intense, the sun was full, and our stomachs were grumbling. 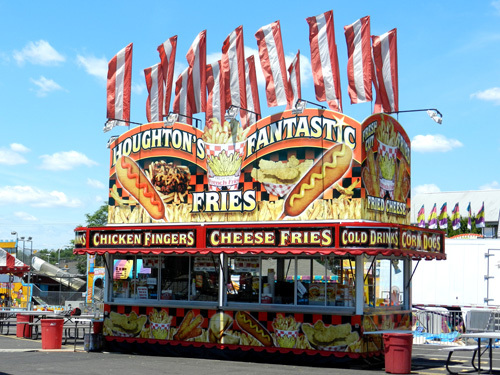 As we started to exit, the manager of Houghton Carnival, smelling all sweet from cotton candy, approached us and asked about my camera and photography... did I like to shoot up close or take distant shots... did I prefer photographing people or empty spaces? We talked for a while and it was mentioned, that if we came back around 3PM, after the church ceremony, I might get some good photos of the bride and groom on the Ferris Wheel. I had forgotten about the wedding party and thanked him for the inside scoop. Now I wish I had gone back for those nuptial snapshots as this post has taken a direction I never anticipated... 'Weddings and Amusement Rides'... who would have guessed? When I write, I usually have a vague starting point, rarely an idea for a middle, and almost never a clue to the ending. It's like 'round and round she goes... where she stops, nobody knows'. A photo of the married couple going round and round on the Ferris Wheel would have been perfect for this spot. Truth is... I would have loved my wedding here... pure fun... no formalities or lengthy preparations to be made, and certainly no fancy outfits to be worn! When it comes to fashion, I believe in the words of Henry David Thoreau, "Beware of all enterprises that require new clothes". With that said, I'd like the ceremony and vows to be somewhat traditional, only held under a circus-like tent. The reception would be more free style, with a menu of hot dogs and boardwalk fries for the entree, and ice cream floats and cotton candy for dessert. For entertainment, there would be rides and games like ring toss, pop the balloon, guess my weight, (let's not), and water squirt races. And there'd be prizes too, souvenirs, of Kewpie dolls, gold fish, and giant stuffed toys and more for everyone!!! When Michael and I first considered getting married, we envisioned a simple civil ceremony, witnessed by a few friends, in San Francisco, where we lived while 'M' did his graduate work. Our families had different ideas... ideas requiring us to fly back East and marry in more customary ways. I eventually came around to realizing that I was the only daughter, the first to be married, and while I did choose my mate for myself, I needed to marry for everybody else. The decision to marry was easy. Finding funds to buy airline tickets and wedding bands was a bit more difficult... a lot more difficult as we were pretty broke, nothing unusual for most college kids back then and now. Then, out of nowhere, I got this zany idea on how to get my hands on some cash fast... no I didn't place a sure bet on a horse to win in the 7th. Instead, I got tickets to a television game show, 'Bowling For Dollars', with the hope of being selected from the audience and winning the jackpot. I was a good bowler. Long story short... I got chosen to play, the lane was a prop made of bumpy artificial material, I won a few bucks and a year's supply of Rice-A-Roni, "The San Francisco Treat"... which kept coming long after the year was up, which was very fortunate for us as we were... remember?... broke! Equally fortunate was that the show got cancelled and my embarrassing moments were never televised for all to see. Yea! One day you may get to hear the long story long, but briefly,... the money we needed came from dipping into Michael's tuition funds and accepting a small loan from a very good friend. Once back East, my parents paid for the affair they imagined, which included new clothes, a rented tuxedo for my dad, a band, florist, caterer and a judge for the ceremony. Coming from different backgrounds and religions, the decision to have a judge preside over the services was the perfect solution. And so at 12:30PM, at The Jericho Manor, in Mineola, New York, during the coldest of January's, Michael and I were married before a small gathering of family. I wish I could recall our judge's name and thank him for the words he chose especially for us, and for the beautiful poem he recited by Khalil Gibran. I wonder too, if after all these years, we are still the only people he wed getting married for the very first time, and in a catered venue instead of a courtroom. I think he would be pleased to know that we are still very happily married and that his presence played a significant role in our positive beginnings. 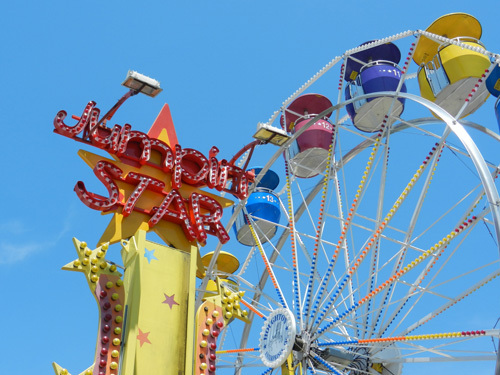 But as I glance through these photos of carnival rides, I can't help but wonder how different things might have been if this was the place we chose for our wedded bliss. I can easily imagine the two of us dressed in our casual summer attire, strolling the grounds with me carrying my camera taking pictures, and 'M', as usual, standing beside me probably holding my purse. 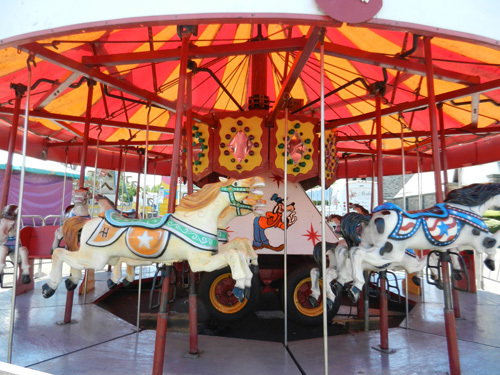 And if I close my eyes, in the background, I can hear the sounds of happy guests laughing, or screaming from heights above the Coater Ride, and the Carousel calliope... piping 'our song'. And for those who say... "what's a wedding without dancing?" go here. And for the final shot, I have no idea who these people are, but it's summer, it's fun, and they're enjoying the ride of their lives... hopefully, long happy ones. 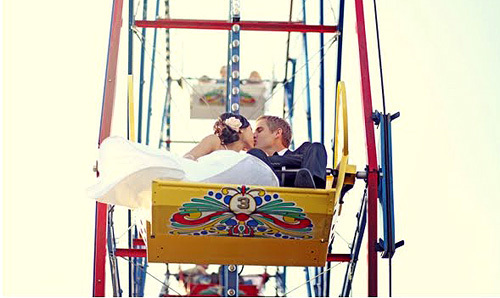 Surely you have some interesting wedding tales to tell or amusement ride experiences that come to mind. Let's hear them. I deliberately left out the part about turning white like a ghost and throwing up afterwards... not my wedding... Coney Island's Roller Coaster Ride. It was my first and last. That's why I take the photos and leave the rides to everyone else. Speaking of that once in a lifetime ride, Coney Island's Cyclone just celebrated its 85th birthday on June 30, 2012. You can read about it here and see some photos here. Rice-a-roni for a year, the amusements of weddings, fun photos at a carnival, the wondrous moments of a lifetime come through loud and clear...When it comes to rides, I am one of the "born to be mild" set. My digestive tract is not one which accompanies roller coasters, nor rides that turn you upside down. 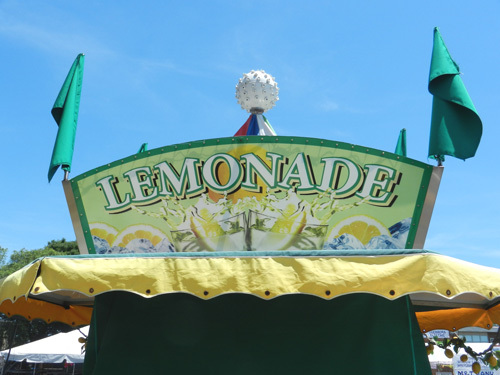 There is a magical sense about fairs and parks which let the spirit soar. I'm getting an urge for some pink cotton candy! I think we share the same digestive tracts. At about 3PM today, I too had an urge for some of the pink, sticky stuff called cotton candy. I could actually smell the sweetness. What a lucky couple to celebrate their wedding at an amusement park! Wish I'd thought of that 40 years ago! Amusement parks hold fond memories for me. When I was a kid, the highlight of the year was going to the school picnic. We rode all the rides and the more they turned you upside down or the steeper and faster the roller coaster, the better I liked it! 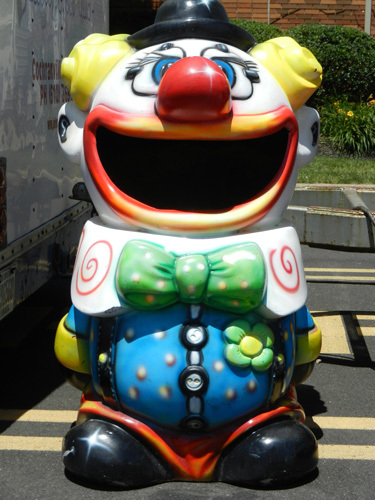 My mom loved the rides too, probably even more than us kids. I can still hear her shouting, "Whooppiiee!!" 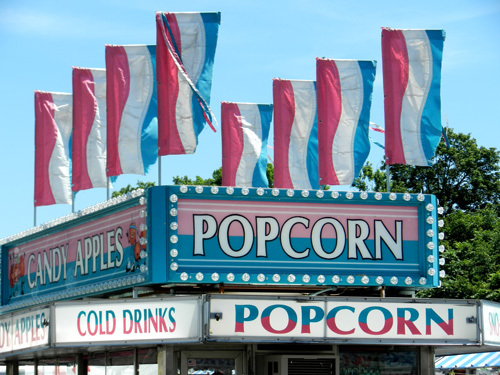 Always, the last thing we did was go "fish" for a prize and buy a box of popcorn to eat in the car on the ride home. Another fond memory was many years later when my mom came out to visit and we went to King's Island near Cincinnati. The Beast was a new roller coaster ride and it was a doozy! I was newly pregnant with my first child but I wanted to ride it anyway. Well, that was an experience like we'd never had before and as soon as we got off, we got in line to ride it again! By the way, my daughter was born 9 months later and none the worse-the-wear for having taken a ride on The Beast! Like mother, like daughter...you and your mom. I'm curious about you and your daughter. 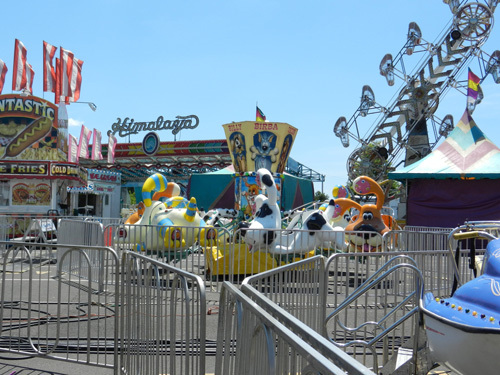 Do you both share the 'wilder-the-better' attitude when it comes to amusement rides or did that prenatal experience on the 'Beast'... twice!... swear her off forever? Like mother, like daughter doesn't apply to my daughter and I in this case. She and I went to Kings Island together several years back. 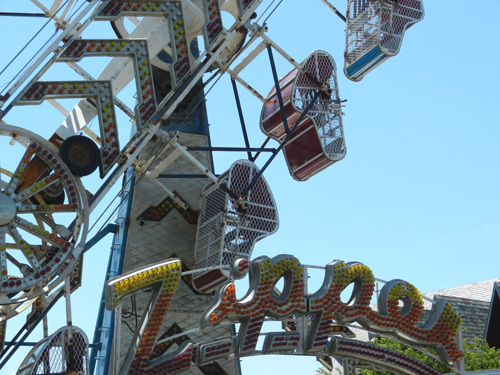 The very first ride was sonsomething that sent you flying very high up in the air and at the same time you were spinning around. I had ridden it before and absolutely loved it. Well, my poor daughter was screaming blood curdling screams of terror! However, we did ride The Beast and she loved it! I, on the other hand, was a little afraid to ride it again because of an experience on it one time. I got a severe case of whiplash going through one of the darkened tunnels and my neck hurt for many months afterward. Fortunately, I didn't suffer that fate this time.